Join CAPE in supporting Public Education on May 1! Donate to our May 1 Bus & Supply Fund using the form below! Click here to get on the bus! On May 16th more than 25,000 educators and parents from across the state marched together to demand more from our legislators. 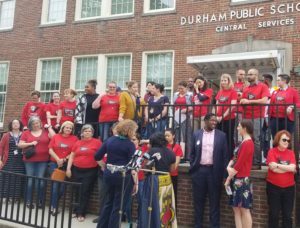 On May 1st, educators and community members will continue to march for the future of education in North Carolina.